Adopting his didactically skillful approach, K.C. 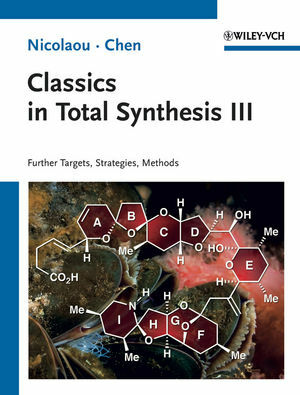 Nicolaou compiles in this textbook the important synthetic methods that lead to a complex molecule with valuable properties. He explains all the key steps of the synthetic pathway, highlighting the major developments in blue-boxed sections and contrasting these to other synthetic methods. A wonderful tool for learning and teaching and a must-have for all future and present organic and biochemists. K.C. Nicolaou holds joint appointments at The Scripps Research Institute, where he is the Chairman of the Department of Chemistry and holds the Darlene Shiley Chair in Chemistry and the Aline W. and L.S. Skaggs Professorship of Chemical Biology, and the University of California, San Diego, where he is Distinguished Professor of Chemistry. His impact on chemistry, biology and medicine flows from his research works in chemical synthesis and chemical biology described in numerous publications and patens. For his contributions to science and education, he was elected Fellow of the New York Academy of Sciences, Fellow of the American Academy of Arts and Sciences, Member of the National Academy of Sciences, USA, Member of the German Academy of Sciences Leopoldina, and Corresponding Member of the Academy of Athens, Greece. He is the recipient of many prizes, awards and honors. Jason S. Chen received his A.B. and A.M. degrees in Chemistry from Harvard University in 2001. After two years as a medicinal chemist at Enanta Pharmaceuticals, he began graduate studies at The Scripps Research Institute under the guidance of Professor K.C. Nicolaou. He received a National Defense Science and Engineering Graduate fellowship, and completed his Ph.D. studies in 2008. He currently is a post-doctoral fellow in Professor Nicolaou's laboratory. Read the press announcement: Our author K.C. Nicolaou has earned three prestigious international honors recently, including the Nemitsas Prize 2014 in Chemistry.